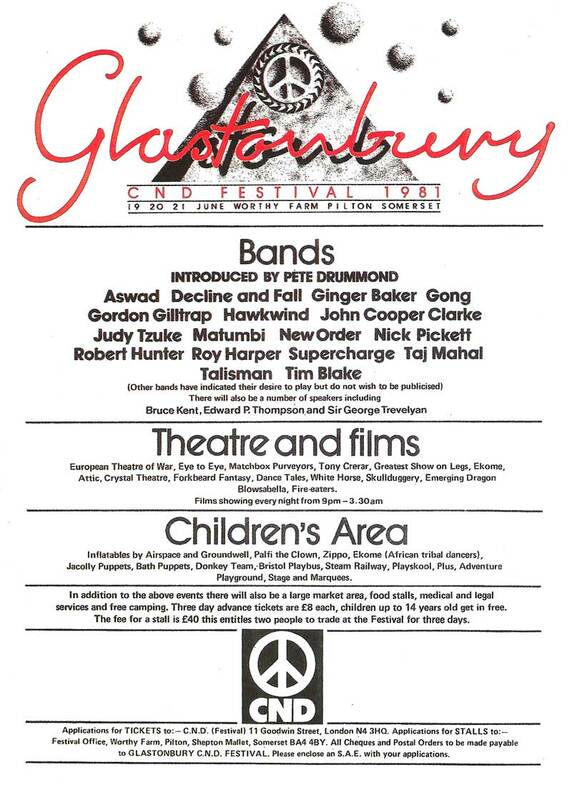 The name was changed to Glastonbury Festival and Michael Eavis took the helm running the event again. This was the first “Campaign for Nuclear Disarmament” festival. Michael helped positively towards the peace movement by holding the Festival at Worthy farm to benefit the Mid Somerset CND campaign. Michael had to convince National CND and said that with proper management the Festival could be turned into a profitable venture. Agreement was reached with National CND sending out information in their mailings, handling advance ticket sales and allowing the use of the CND logo. It was up to Michael to provide the money, arrange entertainment and organise the event, liaise with the authorities and organise market stalls etc. It was this year that it was decided to build a new Pyramid stage. 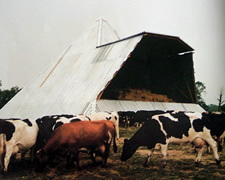 However, this time it was a permanent structure, doubling as a cowshed and animal food store during the winter months. It took two months to build the permanent Pyramid stage out of telegraph poles and ex-MOD metal sheeting. The CND logo was not present at this Festival, as it was too heavy to lift into position at the apex. Michael Eavis eventually handed over approximately £20,000 to a very grateful CND. Acts included: New Order, Hawkwind, Taj Mahal, Aswad, Gordon Giltrap.